On Monday afternoon I visited the Cadoxton OAP group. It is inspiring to see volunteer groups of dedicated constituents giving up their valuable free time for good causes. I spent a great afternoon chatting with these ladies on a whole range of issues. It was a pretty perfect way to start the week! I was so proud of the turn out Monday night by the Neath Constituency Labour Party to take part in the Wales We Want discussion with Ken Skates AM, the Deputy Minister for Culture, Sport and Tourism at the Welsh Assembly. The Wales We Want consultation is a genius idea by Welsh Labour to involve the grassroots of the Party by asking us to contribute to the writing of our manifesto for the Assembly elections in May next year. We had some great ideas proposed and Ken will take them back up to Cardiff Bay to pass on our views. It was fantastic to see so many people turn up and according to Ken it was the best turn out they’ve had. Well done everybody! On Tuesday, despite having to listen to Michael Gove re-writing history during his conference speech, I paid a visit to the Integrated Offender Intervention Service. The Service helps recovering addicts and offenders get the support they need to help reintroduce them to society. During the visit I had the opportunity to shadow the caseworkers who work at the service and I am amazed at the work they carry out helping the homeless and others who are the most vulnerable in society around the constituency. It was truly touching to see the situations these people are in and I hope the service can continue its work for a long time in the future. With the constituency being as big as it is, not everybody can make their way down to my office in Neath town centre. To help combat this, I’ve started to make myself more available around the constituency. Just this week I’ve managed to visit not only Café 46 in Neath but also Trebanos and Seven Sisters. My thanks to the staff at Café 46, Winston Price in Trebanos and Mike Miles in Seven Sisters for helping set up the space for these drop-ins. To finish the week, after my drop-in centre at Seven Sisters Community Hall on Saturday, I hit the campaign trail for the first time with our new Assembly candidate, Jeremy Miles. 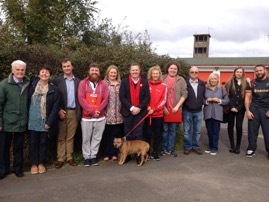 We were joined by some hardy campaigners and Reg, the campaigning dog. The weather smiled on us, even though it was a little cold the sun came through. We absolutely made sure that the door knocking was finished before the Wales match though! I hope by the end of the campaign Jeremy will have every success, but also I will know what the names of the Seven Sisters of sisters actually are! Sunday, I had a great lunch listening to Derek Vaughan MEP speaking about the benefits of remaining in the EU at the meal hosted by David Rees, the AM for Aberavon. Derek works tirelessly in Brussels and Strasbourg on behalf of his constituents, and it’s always a great pleasure to listen to him speak so passionately about Europe, especially considering how vital the EU is to Wales.